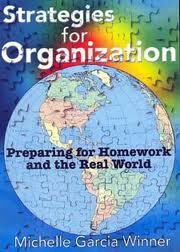 Strategies for Organization Preparing for Homework and the Real World by Michelle Garcia Winner (Booklet plus DVD). This DVD lays out 10 steps of organization many students need to engage in to build successful study systems. Topics such as developing motivational skills and understanding time estimation are covered. Also, this DVD introduces concepts to better understand what type of organizational problems our students have (static versus dynamic), while encouraging us to consider whether our own teaching approach is product or process oriented. 210 minutes. This entry was posted in Education, Our Library and tagged Autism Spectrum Disorder, DVD, Education, Michelle Garcia Winner. Bookmark the permalink.